America’s veterans are disciplined, service-oriented members of our society who are capable of thriving at home and in business. 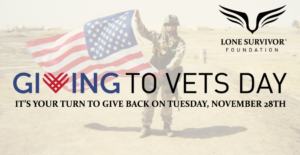 Combat and traumatic military service can take its toll on the health of our service members and their families, but Lone Survivor Foundation is on a mission to restore, empower, and renew hope to these valued members of our community so they can be free to live at their full potential. Post-Traumatic Stress, Chronic Pain, Traumatic Brain Injury, Military Sexual Trauma, and Care Partner Stress are all “invisible” on the surface. However, these are very real conditions that are plaguing our veterans and, if left improperly treated, can reduce quality of life at best and become debilitating at worst. Due to the complexity of these wounds and their emotional implications, not all individuals respond to the standard government treatment plan of talk therapy and medication. Lone Survivor Foundation offers another option. LSF provides a succession of no-cost therapeutic retreats to service members, both active duty and veterans, and their families. The retreats and associated travel expenses are provided free of charge so that help is available to everyone who needs it. The program is designed to provide education, stress reduction, and coping skills that can be put into practice immediately as well as to expose the participants to several cutting-edge modalities proven highly effective in the treatment of invisible wounds. Under the care of some of the best mental health providers nationwide, participants use tools such as Equine Assisted Learning using the EAGALA Method, Neurofeedback with brain mapping (EEG), Trauma-Sensitive Yoga, Creative Arts Therapy and Accelerated Resolution Therapy (ART) during their five day retreat. At the retreat’s conclusion, participants discuss their experiences with their clinician and together they devise a plan on how to move forward in treatment once they get home. The end result of the program is that participants discover the resources necessary for them to create a plan for continued recovery, they are empowered with skills for further healing, their families are strengthened, and their sense of hope is restored.